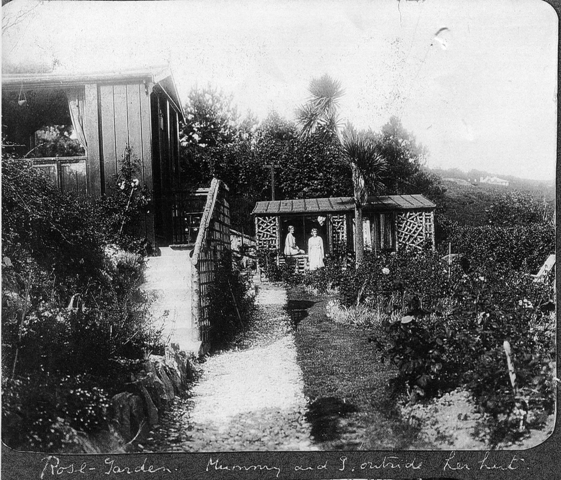 In front of hut (It said Mummy's hut and it is Granny Lumsden and [her daughter] Betty. The hut in the foreground was not there in 1935 and perhaps the one that was Grandpa's in 1935 to the right of the house was built later and this one torn down. 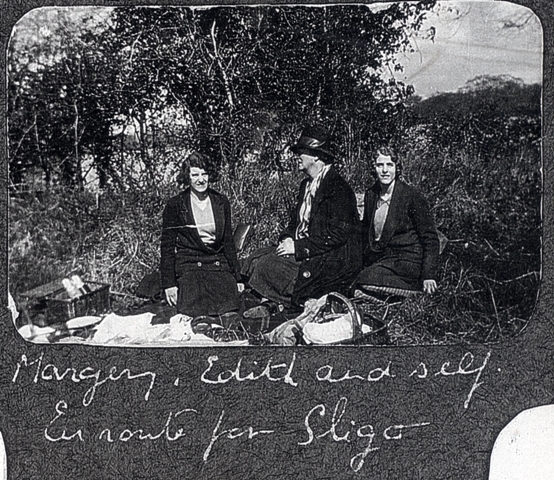 This picture mentions Rose Garden which was not there in 1935 -it was just a path with a high privacy hedge to separate it from the cliff path. The rose garden surrounded the St. John Ambulance cross. 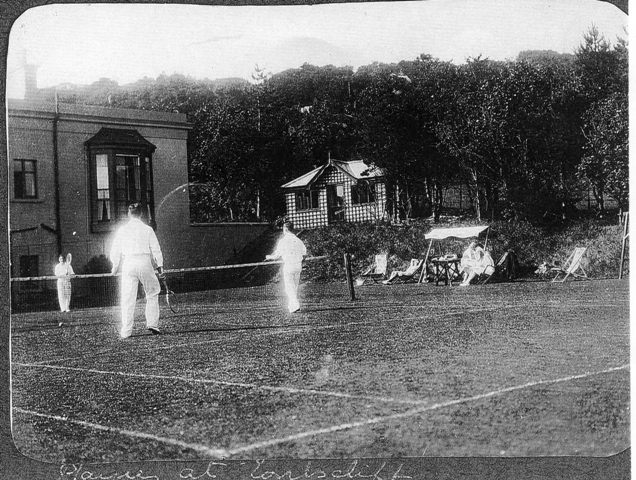 This picture is of men playing tennis and I have not recognized anyone I knew. See the hut up to the right of the house, that was Grandpa's hut in 1935. Instead they had another tennis court further south and there was a putting green on this spot and flower beds (calendula's marigolds et al.) surrounded this lawn. 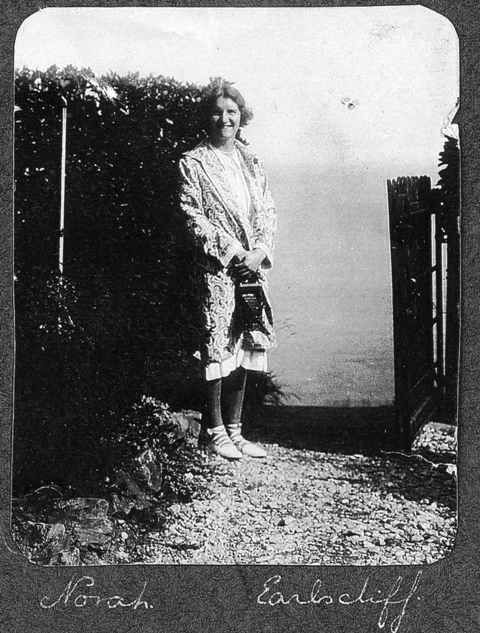 Norah Lumsden by the gate to the Cliff path . There was a tiny goldfish pond to the left and I used to sit there and watch the polliwogs and goldfish. And the polliwogs changed every day turning into frogs. 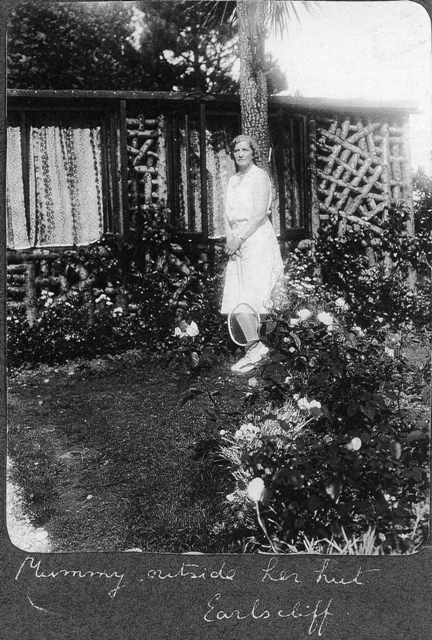 Granny standing by her hut, which of course was only used in the summer. Norah and the first two children Jennifer and Stuart and their Nanny would come over for the summer and they used Grandpa's bedroom ( at the first set of windows was that bedroom (over the Morning room that had French doors to the lawn and Granny's bedroom was next to Grandpa's during the winter. Each room had a fireplace and were used to heat the house. My bedroom was across from the dining room entrance., But I used the one near the front door and the one at the top of the stairs from the kitchens, morning room etc. 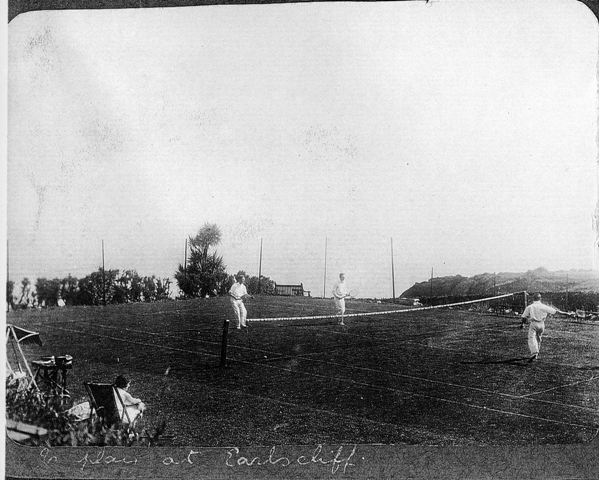 Men playing tennis. Sorry I didn't know any of these men.